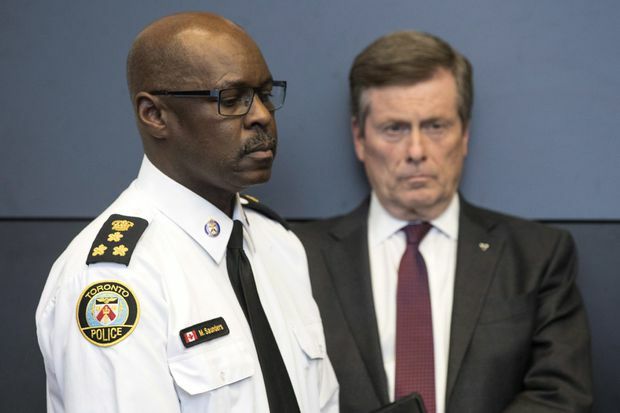 Toronto police Chief Mark Saunders stands beside Toronto Mayor John Tory during a news conference at police headquarters in Toronto on Tuesday, April 24, 2018. Toronto Police will be putting more officers on the streets overnight throughout July and August to combat the surge of gun and gang violence in the city. An additional 200 officers will be deployed across the city between the hours of 7 p.m. and 3 a.m., Chief Mark Saunders said on Thursday at a joint news conference with Mayor John Tory at police headquarters. More than 275 people have been shot in Toronto so far this year, with 26 fatalities. During a five-day period around the Canada Day holiday weekend, at least 10 people were shot − a wave that Mr. Tory and Chief Saunders said at the time was “90 per cent” gang-related. The increased police presence is expected to come through overtime, at a cost of up to $3-million that the mayor said on Thursday will be covered by the city. The chief said they are receiving intelligence, but that the flow of information has been slowing. Part of the challenge, he acknowledged, is the people around these gangs are reluctant to call police out of fear of retribution. Community workers have also cited fractured relationships with police as a reason people may not speak out. In addition to the increased police presence, Mr. Tory said city staff are asking the federal government for funding for community programs that support the youth and communities most vulnerable to gun and gang violence. The mayor aims to invest $12-million through a combination of municipal and federal funds. He said he has had “several conversations” with federal government officials, including Prime Minister Justin Trudeau and Public Safety Minister Ralph Goodale, to ensure that funding is available and will flow quickly. Paulos Gebreyesus, executive director of the Regent Park Community Health Centre, says he is pleased to see the plan goes further than just bolstering the police presence. And while he is optimistic about the push for programming, he worries the requirements for the federal funding could leave some valuable harm-reduction programs − ones not strictly focused on crime prevention − ineligible. “The assumption is that there’s a problem with a specific group of people and we need to straighten them out − as opposed to a broader acknowledgement that there are things like hunger, poverty and social isolation that can often drive people to get involved with gun violence and gangs,” he said. Premier Doug Ford has committed to restoring provincial funding for anti-gang task forces in Toronto and other anti-gun efforts across the province, according to his office. The Premier has said that, along with increasing the presence of police in Toronto, criminals should face longer prison sentences. Two immediate plans are to expand Toronto Community Housing’s YouthWorx summer jobs program to more young people, and to extend to other parts of the city the FOCUS Rexdale program, in which a panel of stakeholders meet weekly to discuss how to address specific issues that come up in the community. Police have issued arrest warrants for two suspects in the June 30 downtown shooting that killed 21-year-old Jahvante Smart, a rapper who went by the name Smoke Dawg, and Ernest Modekwe, 28, a fellow rapper who was also known as Koba Prime. Abdulkadir Handule, 22, and 16-year-old Keyshawn Jones are wanted by police. Chief Saunders said on Thursday that he is confident this Gun Violence Reduction Plan will be effective, noting that neighbourhood policing and the ability to be “nimble” are key parts of the service’s modernization plan, which aims to overhaul policing culture and rein in a $1-billion budget. In a radio interview on Thursday, Toronto Police Association president Mike McCormack said the plan is welcome recognition that the front-line needs a boost − but that officers are in “reactive mode,” struggling to make it from call to call as it is. He did not respond to requests for comment from The Globe and Mail. Chief Saunders has argued that the service’s rigid scheduling system keeps it from deploying resources as needed. Changes to the scheduling system hinge on the service’s collective agreement with the police association, which will be renegotiated by the police services board this fall.